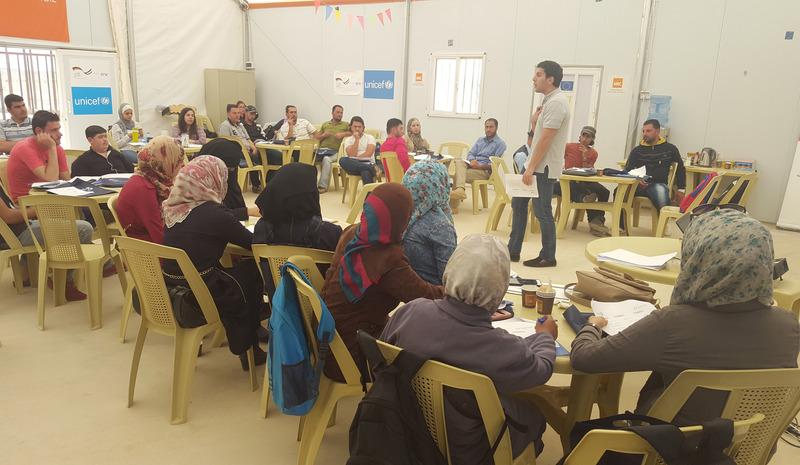 ZA’ATARI REFUGEE CAMP, Jordan, 17 April 2016 – Enthusiastic young Syrian women and men gathered today at a youth centre in Za’atari refugee camp to present innovative ideas and build their knowledge and skills in starting technology, creative and social initiatives. “I am proposing a project on recycling. Hopefully it’ll get selected. We can recycle most of the trash in Za’atari camp – that will protect the environment and benefit the whole community,” said Majdi, a youth participant with a business administration degree. Called the ‘boot camp,’ for entrepreneurial and social initiatives, the five-day workshop which started today at the Youth Centre run by the Norwegian Refugee Council (NRC), will train young people on leadership and life skills such as problem-solving, critical thinking, communication, teamwork and civic participation; and support the youth in starting social projects that benefit their community. During the boot camp, a team of highly talented trainers from Oasis500 will train youth participants with 50 of the best project concepts reviewed by NRC and Oasis 500, based on feasibility and applicability. “Contributing to the development of human beings is the most enriching thing any individual or organization can be part of. We are honoured to have this partnership with UNICEF,” said the CEO of Oasis500, Yousef Hamidaddin. Through dynamic interactive sessions and case studies, participants will learn about ideation, building business models, effective communication, critical thinking and effectively pitching projects for support. “Syrian youth are a vital resource in supporting their communities and rebuilding Syria in the future, and so require opportunities to develop and apply their creativity and innovation skills. This initiative provides a dynamic, practical context for young people to engage collaboratively and address community needs,” said the NRC Youth Project Manager, Paul Fean. Funded by the Government of Germany, the Oasis500-UNICEF project aims at empowering Jordanian and Syrian youth, helping them to create and grow their own companies, providing them with the necessary funds for those who qualify, and improving their critical, analytical, and research skills towards maximizing their potential in both their personal and professional lives. Oasis500 is a leading early stage and seed investment company, the first of its kind in Jordan and the MENA region. Oasis500 aims to nurture creative ideas in Information Technology (IT), Mobile and Digital Media, as well as ideas in the Cultural and Creative Industries sector, transforming them into startup companies.